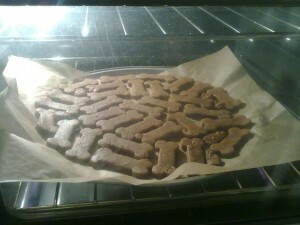 I admit, it’s a little weird making vegan biscuits for a dog and then using a bone-shaped cookie cutter. So, instead, I like to think of them as jolly bow-ties. There, that’s better. Onto the recipe! I made these a few weeks ago and, true to form, forgot to write down what I did as I piled things into the bowl. Now I’ve redone them and they appear to be just as delicious (they passed the puppy snaffle test), so I thought I’d share the recipe with you fine folks who want a plant-based cookie for your dog. They can also be made gluten-free as this is how I made the first batch. This time I ran out of garbanzo flour so added in a bit of all-purpose, the earlier batch was perfectly fine though. Preheat your oven to 300F and line a couple of cookie sheets with baking parchment. Mix your dry ingredients in a big bowl and your wet ingredients really well in a measuring jug, adding as much water as needed to get to the cup mark. Mix your ingredients together to form a stickyish dough, adding a dash more water if necessary or a dash more flour (of any of the kinds) if it’s too sticky to handle. Now you have the options of either rolling out your dough to about 1/4 inch thick and cutting cookie shapes or rolling into pencil thin lines and then chopping every 1/4 inch to form tiny tiny kibbles as training treats. 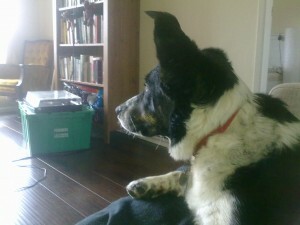 I go for a mix and adjust baking times accordingly (smaller kibbles take less time, about 10mins). Once you’ve cut out, chopped up, rolled up your dough as desired bake your shapes for 15mins or until the house smells deliciously molasses like and the biscuits are firm but not rock hard. Any longer than 20mins and they’ll likely burn so watch out. Transfer the cookies to a cooling rack and keep your pup’s sneaky paws away from them until they’re fully cooled! Parcel them up with a little ribbon and give to friends with fur-friends – these make a great Christmas or dog birthday gift. A great present for every furry friend and their people. 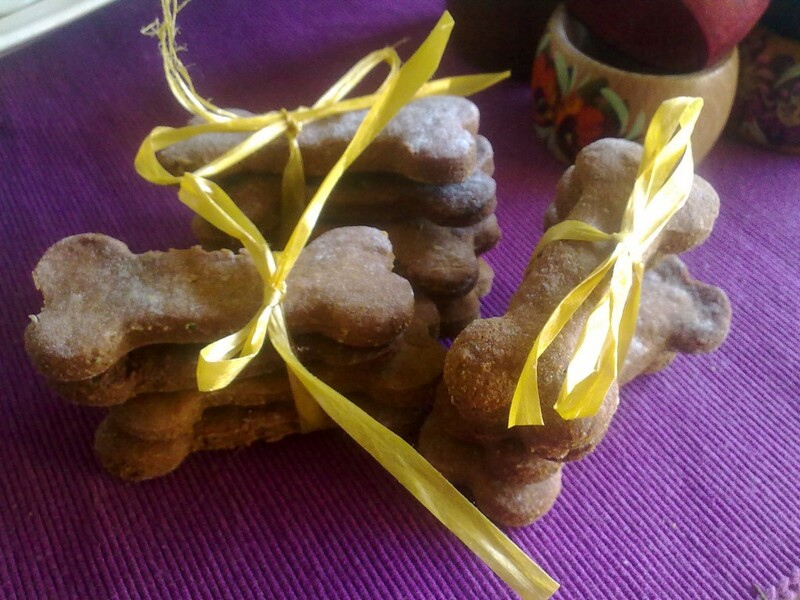 Here’s another vegan dog biscuit recipe, just in case you’re feeling like amassing a stockpile, and don’t forget to read today’s Vegan Companions newspaper!